The Hilton Key Largo has proven to be a very unique Wedding venue for Wedding Pictures. This was Layda and Chris after the ceremony. It had rained, and was very humid. 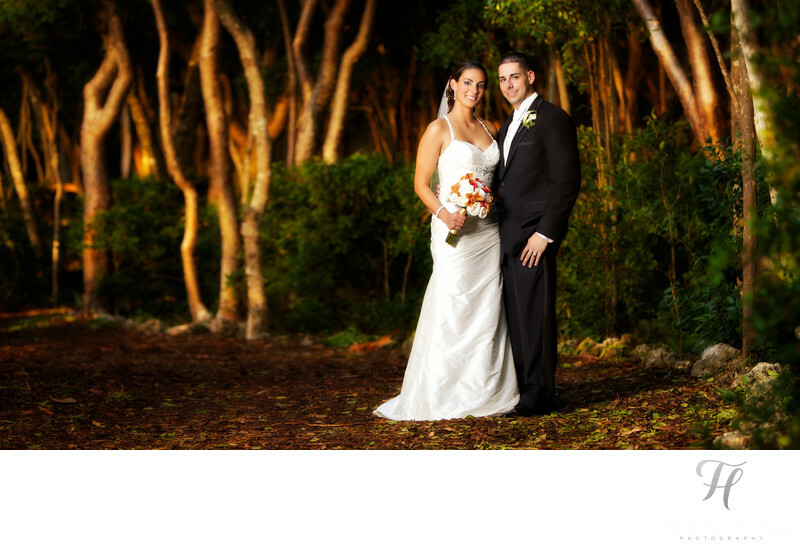 We quickly got this shot walking back to the reception room at the Hilton Key Largo Resort. I had spotted this tree area near the beach, and I actually used a studio light gelled with a 1/1 CTO camera left to create the “effect” of a sun set on the trees. Then, my assistant held the main light on a boom camera right for them. Whats interesting about a shot like this, is that NONE of this could have been seen from just standing there. This was ALL manufactured inside of the camera from the lighting that was put into place. It took me, to "see" this shot in my head, and think about how I could leverage some of my tools to MAKE a shot that would be incredible. Making shots like this is all about a creative process, and it starts with a vision, and then taking action to make it happen. Sometimes my ideas in fact don't pan out, but most of the time they are incredible. It's very much that "chase" for the "perfect shot" in a given situation that drives me to WANT to push the limits and come out with stunning shots like this.